Shares of Walmart (WMT) were mixed on Thursday morning following the release of their third quarter earnings before the market open. The largest employer in the U.S. reported a mixed quarter that was bolstered by a bullish outlook for holiday shopping. Walmart's reported $1.08 in earnings per share cruised past analyst estimates of $1.01, but the retail giant missed FactSet estimates on revenue by more than a half a billion dollars. The company did recognize an uptick in same store sales and an over 40% increase in same store sales. The momentum is helping motivate a guidance raise on earnings per share of $4.75 to $4.85 from $4.65 to $4.80. "We have momentum in the business as we execute our plan and benefit from a favorable economic environment in the U.S.," CEO Doug McMillon said. "We're accelerating innovation and utilizing technology to shape the future of retail. We're making shopping at Walmart faster and easier." McMillon noted that the holidays are likely to continue the momentum by driving convenient shopping options in the hectic season. "With the holidays approaching, customers can count on Walmart to save them money, and we'll also provide busy families with another important gift -- time back in their day," he said in a statement. McMillon announced his expectation of even further domestic digital growth after posting 43% growth in the quarter. 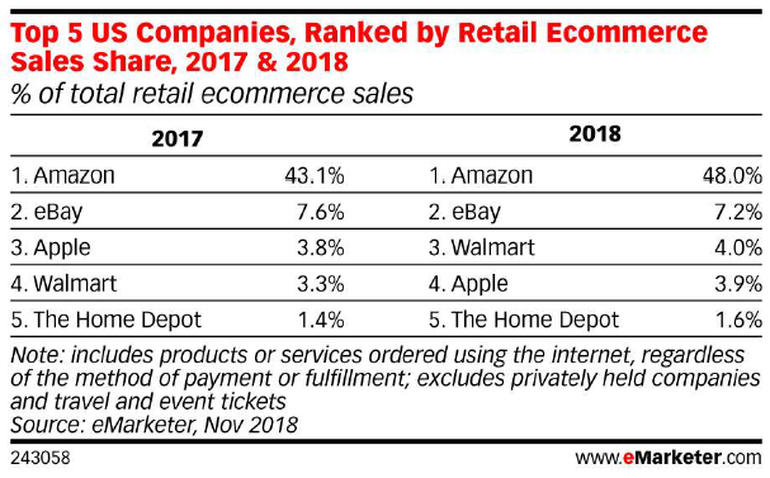 The company's eCommerce push in the U.S. is helping bring it into competition with eBay (EBAY) and toward Amazon's (AMZN) eCommerce crown, according to recent numbers form eMarketer. The growth in the U.S. amid the peak season should be bolstered by part of the world that might not even know it's Christmas, as Band Aid once said. The company's partnerships for eCommerce include Indian eCommerce giant Flipkart and Chinese tech giant JD.com (JD) . Flipkart had previously been identified as a drag on profits due to its hefty $16 billion price tag and was blamed for a 42 basis point drag on margins in the quarter. Margins have already been squeezed this year for the retailer amid supply chain concerns, dropping from 25% a year ago to just over 24% in the third quarter. Still, the company appears to have largely registered the hang up from the purchase and margin pressure given its guidance raise for the full year despite the acquisition. "Amid many strategic investments and continued GM pressure, we think the key takeaway is more about the strength of comps," Credit Suisse analyst Seth Sigman wrote in a note Thursday morning. "The results reflect WMT's various in store and online initiatives and seem to indicate solid share gains again, as well as an overall healthy consumer backdrop." Certainly, the wage and job reports from earlier this month lean toward a bullish bias. That said, one thing that the company cannot move beyond so quickly are the misconduct allegations against Flipkart CEO and co-founder Binny Bansal which was followed by his resignation. The company has not made clear precisely what Bansal was accused of, simply calling them allegations of "serious personal misconduct" that were thoroughly investigated. "While the investigation did not find evidence to corroborate the complainant's assertions against Binny, it did reveal other lapses in judgement, particularly a lack of transparency, related to how Binny responded to the situation," the company said in a statement. "Because of this, we have accepted his decision to resign." The company will now operate with Kalyan Krishnamurthy, a former Tiger Global Management managing director and eBay director of finance, as CEO of a Flipkart in flux. The market will take some time to parse the results, but the acceleration in eCommerce and sales growth at the country's largest employer and retailer is helping calm some nerves for those worried about a bear market clawing at the holiday season. The strong environment should add to bullishness amid a depopulating industry as well, as Sears (SHLD) , Toys R Us, and now possibly JCPenney (JCP) make exits from competition.